Warrington’s booming high technology hub, The Base in Dallam Lane, has passed a key employment milestone thanks to the town’s thriving SME sector. 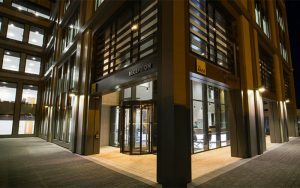 The building is now home to more than 200 employees spread across 21 businesses, with growth being fuelled by expansion of existing tenants as much as new arrivals, according to Sylvie Morton, business development manager at Langtree, which manages the Grade-A office building on behalf of Warrington & Co. The Base has attracted a wide range of employers involved in software, IT, engineering and technology consultancy, with 13 new arrivals in the last twelve months. Three companies have expanded their office space so far this year and in a survey in 2017 tenants recorded average sales growth of 52.2%, year-on-year. “The Warrington economy has a great SME base to match the large number of major employers attracted by its connectivity and availability of suitable premises,” says Steve Park, managing director of Warrington & Co, the private sector-led regeneration arm of Warrington Council. “The Base has developed its own eco-system, with many tenants collaborating on projects. The energy of the place is compelling,” added Mr Park.